We're excited to announce our latest TalkPath product, TalkPath News is now available for Android and Apples device users! Not only is TalkPath News Lingraphica's first Android app, it's also the result of a long-held dream to help adults with aphasia and other speech disorders enjoy the news. For more a decade, we've hosted a number of meetings with our Lingraphica Aphasia Users Group. During our meetings, we often hear that aphasia creates a communication barrier for many of our members. As a result they limit their interaction and communication with their surrounding communities. Many members report occasional isolation and difficulty enjoying tasks that involve using language skills. One of the biggest issues many individuals face is frustration reading, listening, or watching the news. Print publications can be too wordy or challenging to understand, while broadcast news anchors often talk too fast for individuals to follow along. These combining issues mean that adults often don't know what's going on in the world -- a component of daily life that we all take advantage of some times. With this realization, we started looking into an innovative solution to help our members re-engage with the news. Based on the feedback from the group, we knew we needed to slow down broadcast news, while also making newspaper-like articles available. Our solution combines multiple modes of stimulation to help users process the language presented by the news anchor. Each TalkPath News article is read aloud and highlighted (to encourage proper pacing). Additionally, colorful control buttons assist users and help them skip, forward, or pause an article. Plus, every story ends with a series of questions — sentence completion, multiple choice, or vocabulary — about the article. Performance on these questions, as well as how long each took, are tracked and reported back to the user. Articles on TalkPath News look very similar to the headlines and photographs you would find in top publications. Now, the entire platform is accessible to Android and Apple device users. Feedback from our Aphasia Users Group is simple, they love it! 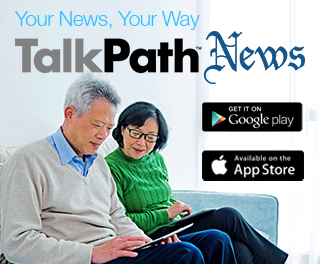 TalkPath News is free to use for individuals and clinicians. Users need to create a free account to access the headlines. To download the app, click the buttons below or visit www.talkpathnews.com . Have feedback for our team about a product you'd like to see us develop? Tell us here.